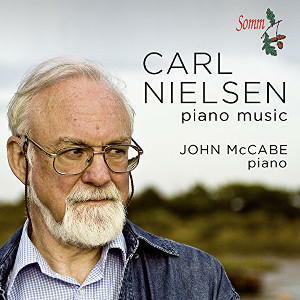 The reissue in April 2015 on SOMM (SOMMCD 0146-2) of the solo piano music of Carl Nielsen by John McCabe has proved very timely, and has attracted much attention, coming as it has so soon after John’s sad death after a lengthy illness, and in the 150th anniversary of Nielsen’s birth. Billed as the ‘complete’ piano music, it very nearly is, and was believed to be so at the time, but one or two very short pieces have been discovered since. The works themselves are of the greatest interest, and many, such as the Suite Op. 45, Chaconne, and Theme and Variations are outstanding by any standards. They were recorded by John McCabe in 1973/74, by the late, great recording engineer Bob Auger, and were issued by Decca on their Ace of Diamonds label in 1975. They have, however, been unavailable for many years, and the old-fashioned 1-inch tapes were beginning to reach the end of their lives when they were rescued and re-mastered by Paul Arden-Taylor (Dinmore Records) for this double-CD album for SOMM. The performances, and the restored recording, have been accorded much critical acclaim, with reviews already in the major newspapers, website magazines (themselves of increasing importance these days) and in the Presto (retailers) Newsletter. A warm review has also already been carried by the leading music magazine Musical Opinion (April-June issue), and doubtless the other major magazines will follow suit. John McCabe was a superb sight-reader, and took much delight in exploring unjustly neglected music. He was an ardent advocate for these wonderful works, performing the great ones frequently in recitals. The Nielsen recordings were made during the period that he was also making his epic journey through the complete (so far as the music still exists) piano sonatas of Haydn, which were issued by Decca (now London), and which are available still in a 12-CD boxed set. These recordings have never been out-of-print in the 40 years since they were made, which might in fact be some sort of record in itself!